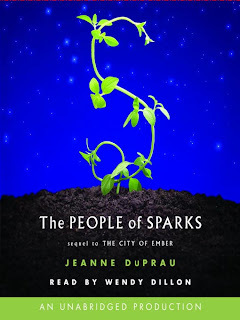 This book was interesting, though a little bit disappointing after City of Ember. It's about a post-apocalyptic society trying to survive with pre-industrial revolution level of technology, but with pieces of stuff that still works from before the disaster - towing trucks with oxen, for example. The story is really about what happens when the people from Ember try to mix with those who survived the disaster, and the conflict that arises. The story is plausible, but to me the dialog and the emotions and interaction between characters seem simplified, as if written for a very young audience - maybe third grade level or so. I think that part of that, though, is due to the reading style of Wendy Dillon. Her voices are too diminuitive, and her intonations make it sound like she's reading to children. I haven't actually read this one - I was waiting to post a review until I had read the paper version to see if I got the same impression, but I gave up - haven't had much reading time lately. I'm hopeful that the next book, the Diamond of Darkhold, will pull the series out of the slump I feel right now. Otherwise, I'll recommend that you stop after City of Ember and read the wikipedia synopsis of the others if you want to know what happens to Dune and Lina and the Ember crowd.